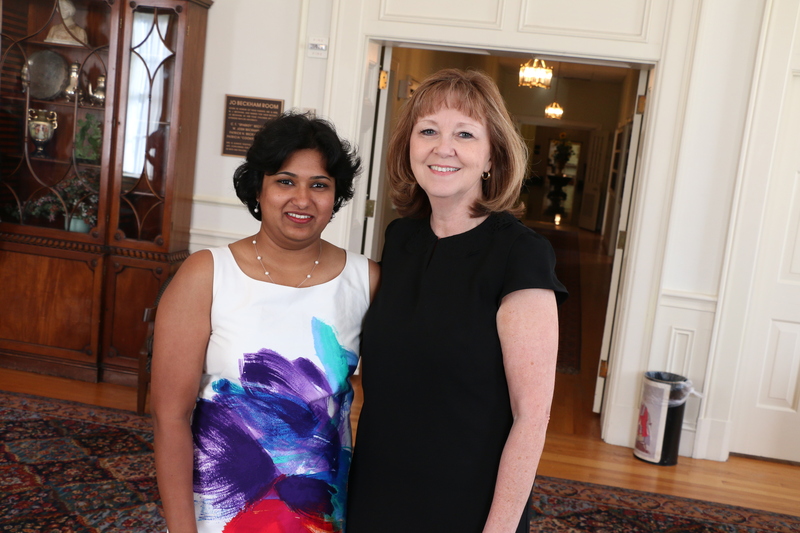 Dittika Gupta, a 2014 Ph.D. graduate from the Baylor School of Education, and Trena Wilkerson, Ph.D., professor and graduate program director of curriculum & instruction in the School of Education. WACO, Texas (Oct. 14, 2015) — Dittika Gupta, a 2014 Ph.D. graduate from the Baylor School of Education (SOE) in curriculum & instruction, said she hoped to start a national dialogue about early mathematics curriculum when she chose her dissertation topic. Now that the dissertation has won a national award from the School Science Mathematics Association (SSMA), the dialogue has begun. Gupta, now assistant professor at Midwestern State University in Wichita Falls, did a qualitative analysis of data collected by Baylor researchers — including Gupta herself — over a seven-year longitudinal study on the teaching of fractions to students in grades K-3. Gupta will receive the Outstanding Dissertation Award for 2015 at the SSMA national convention Oct. 29-31 in Oklahoma City. Only one award is presented nationally. Gupta’s case-study analysis showed that students learned fractions better if they had early exposure to basic concepts with an incremental increase in complexity of the curriculum over several years before the introduction of formal, traditional fraction work. Baylor collected K-3 student data from a local Professional Development School (PDS) campus every fall semester from 2007-2013. At the time the study began, Texas curriculum standards incorporated early fraction concepts in kindergarten curriculum, although the Baylor-developed curriculum was more in-depth. The earliest concepts include working with counting and division of individual items in a group, like cookies, versus splitting up one item, like a pie, to learn about the fairness of sharing in those contexts. Now the TEKS (Texas Essential Knowledge and Skills), as well as the national Common Core standards, do not introduce fraction concepts until third grade, except for the splitting of a whole into halves or thirds, introduced in second grade. “As a result of our study, we found that an earlier exposure is better because it gives the time and opportunity to develop necessary skills,” Gupta said. Gupta said the experience of working with this study has launched her on a crusade to change the national and state curriculum standards. “I will publish as much as I can until they actually change the standards,” she said. Gupta’s dissertation, titled “Early Elementary Students’ Fractional Understanding: Examination of Cases from a Multi-year Longitudinal Study,” examined case studies of students who participated in Baylor’s fraction curriculum, taught in small groups, for at least three years and who had both a pre-test and a post-test for those years. She said the sub-group was small because of the mobility of students at the school. The years the students were enrolled were not always consecutive, and one student even repeated a grade. For those students who missed a year of the curriculum, she said, a deficiency showed in their test results. “The level of understanding was greater if they were in consecutive years rather than non-consecutive years,” she said. “Dittika is someone we will hear about in the future of mathematics education; she is looking at teaching and learning of mathematics from a national perspective. She is an amazing teacher and researcher, she is a delight to work with, and she was an outstanding scholar as a graduate student here, ” said Trena Wilkerson, Ph.D., professor and graduate program director of curriculum & instruction in the School of Education. Gupta is a member of the competitive STaR Fellows Program, which supports the development of early-career mathematics educators with a doctorate. Originally funded by the National Science Foundation, the program is now operated by the national Association of Mathematics Teacher Educators (AMTE). 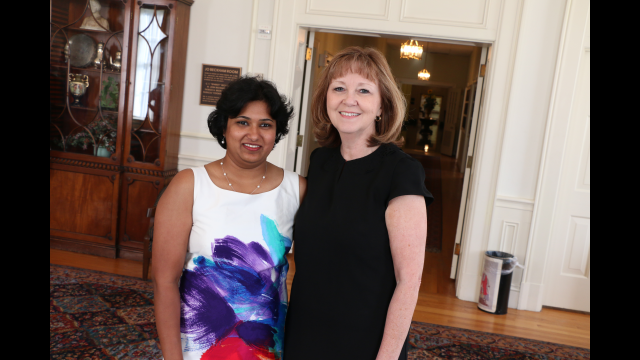 As Wilkerson’s graduate assistant, Gupta was involved in the fraction study for many years and was part of a summer graduate class that designed the curriculum for the study. For the overall seven-year study, more than 500 elementary students participated, and almost 300 have pre-test and post-test data for at least one year, Wilkerson said. An upcoming article — “Teaching and Learning of Fractions in Elementary Grades: Let the Dialogue Begin!”— based on Gupta’s dissertation, published in the journal Curriculum and Teaching Dialogue, the scholarly journal of the American Association for Teaching and Curriculum, will be the second publication generated from the study, Wilkerson said. The first one appeared in the Journal of Research in Childhood Education. Titled “An Investigation of Fraction Models in Early Elementary Grades: A Mixed-Methods Approach,” it was authored by Wilkerson, Susan Cooper, Gupta, Mark Montgomery, Sara Mechell, Kristin Arterbury, Sherrie Moore, Betty Ruth Baker and Pat T. Sharp. The seven-year study involved Baylor faculty members Baker and Sharp, plus Dr. Rachelle Rogers and Dr. Sandi Cooper, Wilkerson said. Wilkerson said she believes the research coming out of the SOE study will indeed spark a national conversation about mathematics curriculum. “I think this study gives us the opportunity to have some serious discussions — and some data to back it up — about pathways for teaching and learning fractions in early grades,” Wilkerson said.